Rainbow Resort is an amenity-packed resort with friendly people and a relaxed atmosphere. 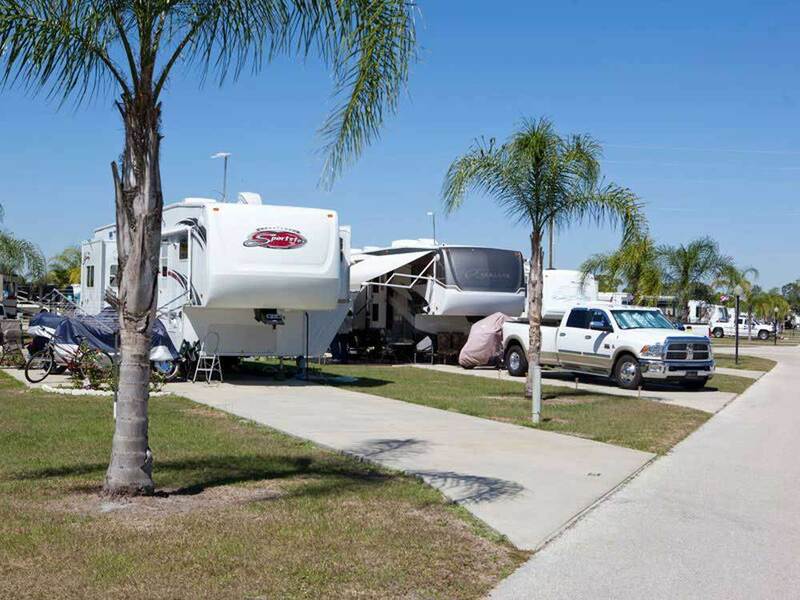 Our RV sites have cement pads with space to relax. We also have RVs for rent! Not so nice park, high prices, poorly kept grounds, ants out of control, mounds of red ants everywhere, soft sand sites (leveling jacks with extra big base sink in 6" plus), wifi is poor at best, cell signal is really bad. Seemed to be more interested in yearly residents then campers. I will not stay there again. We stayed at this park in '15 and '16 for 6 months each year.. the park has great appeal and pool is clean and huge. Great residents and lots to do. the RV sites are very irregular. Some are dirt and crushed shells. the bathhouses could be fantastic but are cleaned once a week. floors are not moped when the do. The major problem is SUN corp. bought the park three years ago and the environment has gone down hill since. We were told we couldn't come back unless we gave them our SS numbers for a background check and bank info and all. we had to pay to have our site updated and they increased the rates driving out long term residents. and us. very intrusive owners and they don't care about the existing renters because they are betting on new boomers. Water is so bad we ran two filters. WiFi is hit and miss. WE will avoid any Sun park like the plague. Tried to put deposit for this year for another 6 months and were told they would let me know the month before our stay. Unless I signed my life away!!! We love our new park!! Too bad Sun does not care about long term customers and the community that it creates.